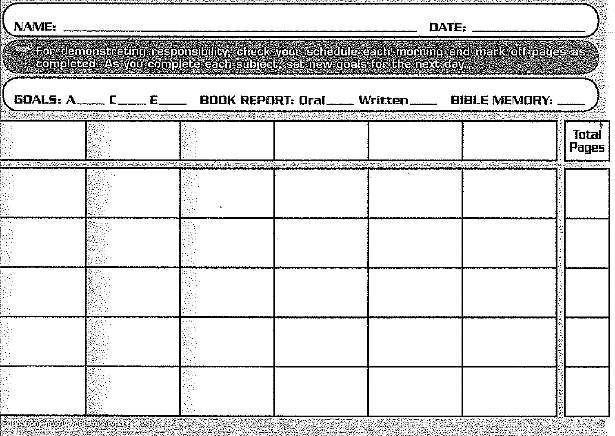 The Daily Assignment and Goal Chart can be a valuable and useful form in your homeschool program. This card allows students to set and track goals. This form is not required and does not need to be returned to Bridgeway Academy. Students should enter their name in large letters at the top of the card. The card is two-sided which allows it to be used for two weeks. Students should be trained to set reasonable goals and accomplish them regularly. The Daily Assignment and Goal Chart helps students maintain an orderly and consistent chart of their goals and their daily progress and achievement. This procedure teaches students to strive to accomplish their goals each day. As time passes, students learn that they can accomplish large amounts of work by being consistent and doing small amounts of work each day. Note: If instructor guides are available for the courses your student is taking, the pacing in the instructor guides should be reviewed and used in the setting of goals. 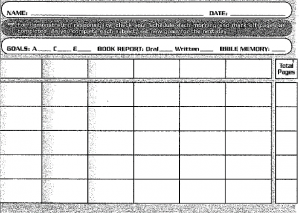 The student determines the page numbers to be completed in each subject and fills in the appropriate box on the chart. As students complete their goals in each subject; instruct them to draw a diagonal line through each completed goal. The student enters the page numbers of the work they plan to do the next day in that subject. The student must be required to enter specific page numbers in each subject using a pen. The chart should be checked each day to make sure that the student has actually completed the previous day’s goals and has set reasonable new goals in each subject. This checking should be done each day before or after study time. It is recommended that you do not allow students to scratch out or cover up goals. Any goal changes should be made by the parent.